Industrial workers around the world are subjected to hazards that can cause temporary or permanent injuries to their vital body parts, particularly to the face and eyes. Governments and industrial regulatory bodies have set mandates for the use of proper protection equipment in industrial settings. Goggles and face shields are being widely used as eye and face protection equipment. Companies and employers are being trained to promote the use of such equipment among their workforce. Growing complexities in the manufacturing sector are exposing workers to more risks of getting injured by toxic substances, sharp metal surfaces and volatile gases. However, the standardization of guidelines on the production and use of eye and face protection continues to be inharmonious. In developed countries such as the US, national safety standards and state-wise occupational health regulations are conflicting. Manufacturers of eye and face protection equipment are being challenge to meet these diverse standards. The global eye and face protection market is also witnessing a growing implementation of awareness programs. To ensure maximum worker protection, eye and face protection programs are being commissioned, wherein in the employers are provided information on how proper use of eye and face protection equipment among their workforce can help them reduce business expenses accounted by indirect costs of treating the injured workers. Such factors will continue to influence the expansion of the global market for eye and face protection in the near future. 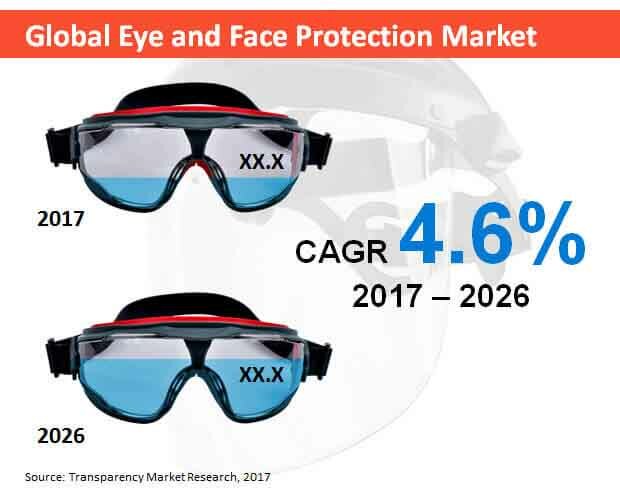 Transparency Market Research’s forecast report on the global eye and face protection market reveals that during the period, 2017-2026, the global eye and face protection market will expand at a sub-par CAGR of 4.6%. The report further estimates that more than US$ 4.5 Bn worth of eye and face protection equipment will be sold across the globe by the end of 2026. The report observes a predominant demand for eye spectacles and goggles in the global eye and face protection market. In 2017, global sales of goggles and eye spectacles accounted for more than 70% of the overall market revenues. While these two products will continue to remain top-sellers through 2026, a considerable upsurge in demand for laser safety goggles is expected. The report projects that laser safety goggles will register fastest revenue growth in the global eye and face protection market, reflecting a value CAGR of 7.4% over the forecast period. The report further reveals that eye and face protection equipment will be predominantly used in the manufacturing sector and the construction industry. Through 2026, the manufacturing and construction applications of eye and face protection equipment are expected to collectively account for over one-third of global market value. The report further reveals that the application of eye and face protection equipment in chemicals industries will register fastest revenue growth at an estimated CAGR of 6.1%. Pharmaceuticals production, food processing, mining, and agriculture will also be observed as lucrative applications in the global eye and face protection market. Key companies manufacturing eye and face protection equipment have been profiled in the report. Companies namely, 3M Co., E I Du Pont De Nemours and Co., Honeywell International Inc., Ansell Limited, Avon Rubber Plc., Msa Safety Inc., Uvex Safety Group, Grainger, Inc., Bullard, and Kimberly-Clark are expected to spearhead the global production of eye and face protection equipment through 2026. A key challenge for these companies is meeting the diverse occupation safety standards implemented across different parts of the globe. While several companies are aiming at cost-effective procurement of raw materials to increase profit margins, there has been a considerable rise in the expenditure towards developing robust protection equipment. Employees and workers in every industrial vertical are subjected to occupational hazards. Permanent or temporary injuries to the face and eyes of workers has become a common incidence. Particularly in heavy industries, chemicals manufacturing units and automotive plants, the exposure of workforce to corrosive materials, toxic substances and sharp metal surfaces has propelled the adoption of proper equipment for eye and face protection. Protecting these vital body parts has become an industrial mandate, compelling manufacturers of personal protection equipment to focus on developing reliable goggles and face shields. Employers are spending millions of dollars on equipping their workers with proper protection gear for face and eye. Occupational safety administration bodies in several parts of the world has standardized the use of eye and face protection equipment across every industrial settings. Considering such factors, Transparency Market Research (TMR) has captured the current backdrop of the global eye and face protection market and drafted a forecast study for the assessment period, 2017-2026. In this study, the global eye and face protection market has been extensively analyzed across a range of parameters. Developed on collaborative research model, this report provides market size estimations on the basis of revenues procured by market leaders in the recent past. This data has been employed as a baseline to draw future market scenario. Findings from the report have been validated through multiple levels of quality check and authentication. Qualitative insights developed in the report provide information on the factors influencing the production and end-use of eye and face protection equipment. Diversity in occupational safety standards across the globe has been studied. Trends associated with the manufacturing and use of personal protection equipment have been addressed. The report has further identified the causative factors for growth of the global eye and face protection market. Impediments with respect to the adoption of eye and face protection have been analyzed in the report, as well. Key sections of the report provide segmental analysis on the global eye and face protection market. Information in these chapters has been derived for research methods and calculative formulations that assess the values available and create presumptive scenarios by infusing the impact of qualitative insights. Product-type, application and region are the three primary segmentations employed in the analysis of the global eye and face protection market. The market taxonomy has been illustrated below. TMR’s forecast study on the global eye and face protection market is directed to discuss the concerns of key companies manufacturing these equipment. From pricing and cost structure to raw material procurement strategies and supply chain, the report has analyzed a slew of aspects encompassing the eye and face protection market. Consumer-side research and demand-supply analysis are key factors that make this report a credible business document. Opinions of industry experts have been cited and the forecasted market size estimations have been interpreted through multiple metrics. A detailed assessment of the global eye and face protection competition landscape has been developed in this report. Companies operating in the global eye and face protection market have been profiled on the basis of their current market standings. Unbiased and first-hand information compiled in the report is aimed to enhance the understanding of market players towards strategic developments of their competitors. Inferences provided in the report are aimed at enabling market participants in planning their next moves towards the future of global eye and face protection market.